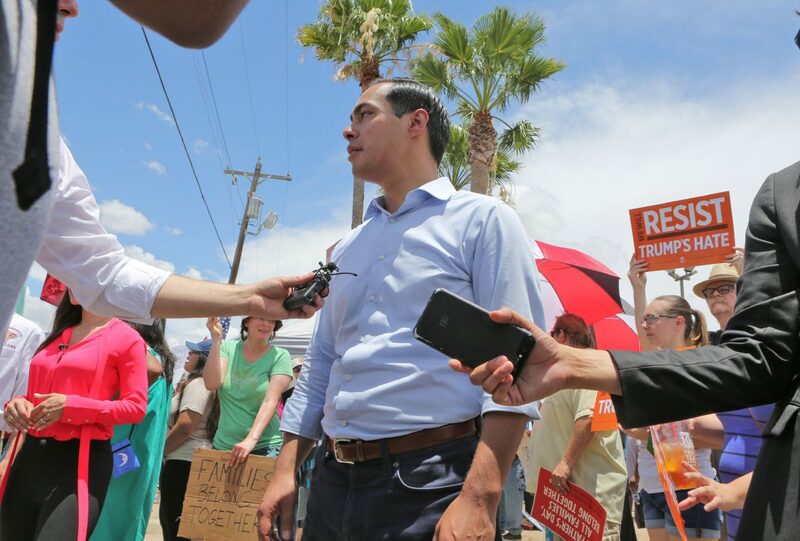 Former San Antonio Mayor and Secretary of Housing & Urban Development Julian Castro talks with member of the press in front of the U.S. Customs and Border Protection's Rio Grande Valley Sector's Centralized Processing Center on Sunday, June 17, 2018, in McAllen. McALLEN — Shirley Ramos didn’t realize Sunday afternoon that she was likely about to be separated from her young child. Within a cell she was sharing with at least 20 other people, Ramos leaned against a chain-link fence inside the U.S. Border Patrol’s centralized immigration processing center in McAllen, where she and her young boy, a toddler, had just finished their lunch — two snack-sized bags of potato chips and bottled water. The 20-year-old Honduran woman said she and her son were detained Friday as she attempted to enter the country illegally. Just after 1 p.m. Sunday, members of the media were given a tour of the more than 77,000-square-foot facility, where at that time nearly 1,120 detainees — Ramos and her child among them — were held inside as many as 17 cells, awaiting to be processed and referred for criminal prosecution. U.S. 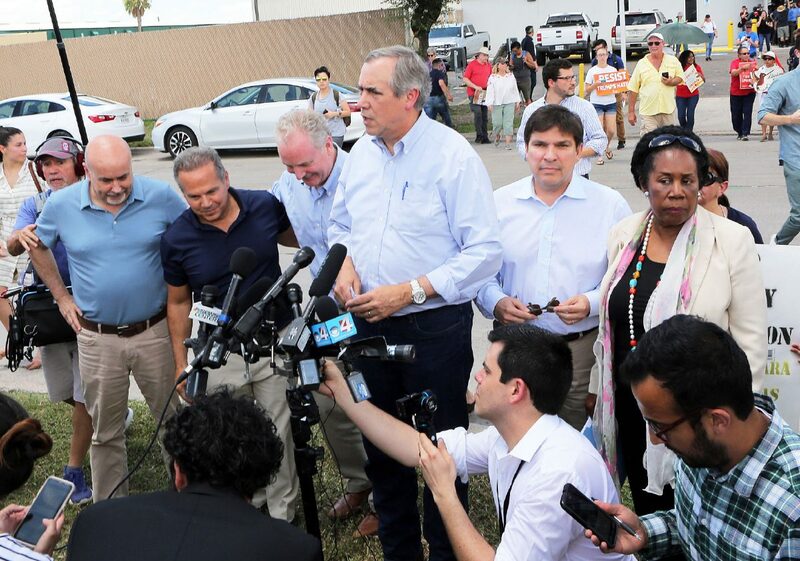 Senator Jeff Merkley from Oregon, speaks to the press along side other lawmakers in front of the U.S. Customs and Border Protection's Rio Grande Valley Sector's Centralized Processing Center on Sunday, June 17, 2018, in McAllen. 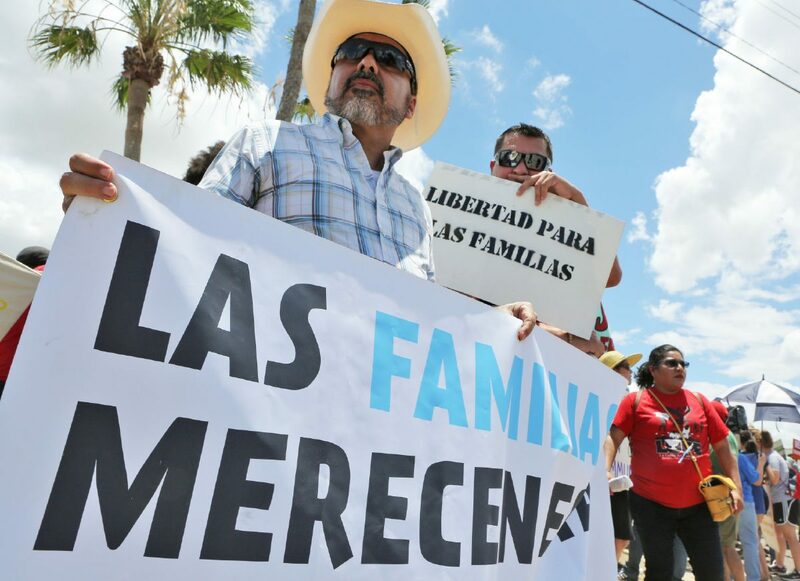 Protestors hold signs in front of the U.S. Customs and Border Protection's Rio Grande Valley Sector's Centralized Processing Center on Sunday, June 17, 2018, in McAllen. In one cell, a man sat on the floor atop a thin mattress as a little girl sat next to him. When asked if she knew she was going to be separated from her child, Ramos looked up and said no one had made her aware of that. Ramos, like the hundreds before her, will likely be transferred Monday for criminal prosecution at the federal courthouse. According to John Lopez, Border Patrol’s active deputy patrol agent in charge at the processing center, agents do not tell parents or guardians that they’ll be separated from their children until it’s determined whether they will be sent for criminal prosecution. At that point, the child would become unaccompanied and subject to transfer to a Human Health Services Department facility with the Office of Refugee Resettlement. This is where hundreds of children have been placed since April, when U.S. Attorney General Jeff Sessions announced a “zero-tolerance” approach to prosecution of illegal entry cases. Sessions implored government prosecutors along the southwest border to prosecute all illegal entry cases, leading to an increase in criminal prosecutions of those with no prior criminal history. Sessions has publicly defended his memorandum, stating that separating children from parents is paramount to deterring future illegal crossers making the trek to the U.S. from their home countries. 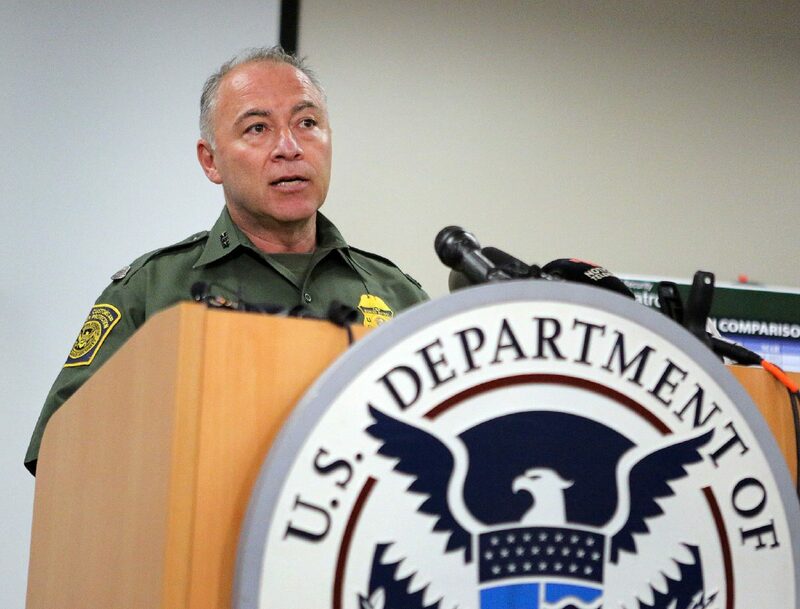 Border Patrol Rio Grande Valley Sector Chief Manuel Padilla Jr. held a news conference of his own on Sunday prior to the tour of the processing center, where he echoed Sessions’ take on the change in policy. His message came amid mounting concerns from U.S. lawmakers about children being separated from their parents, as well as growing media attention and an American public becoming increasingly alarmed. One such case that sparked a media firestorm and criticism of the Trump Administration policy was the May suicide death of a Honduran man, who hung himself inside his holding cell in the Valley after being separated from his wife and 3-year-old son. Padilla gave an update on the implementation of the policy, stating plainly that Border Patrol is working to get “100 percent” of those who cross illegally referred for criminal prosecution. Padilla acknowledged how the new policy has had an impact on the U.S. Marshals Service, federal court services, and Immigration and Customs Enforcement. He cited a “complex” view of the border, including issues with stash houses where immigrants are often mistreated, held in deplorable conditions and assaulted in some cases, as well as what the agency calls an “influx” of MS-13 gang members crossing into the interior of the country, and the smuggling of persons in tractor trailers. When asked what separating children from their parents accomplishes for Border Patrol, Padilla said the policy is meant to deter future illegal crossers, stating that exempting any group from consequences would only draw more people to cross into the country. Adding that his agency’s job is to “implement” this policy, Padilla said this separation would also happen if any U.S. citizen who was detained by a federal agency had a child in their custody and were then referred for prosecution. With the national spotlight again on the RGV sector — including district courts within the Southern District of Texas, where the misdemeanor defendants are being criminally processed — U.S. Magistrate Judge Peter E. Ormsby announced Thursday his consideration of an order prohibiting the government and Border Patrol from separating children from defendants who receive time-served sentences. Calling it a matter of “basic compassion,” Ormsby said he’s mulling making an official order or an oral direction to Border Patrol, just as he would if someone had requested their property be returned to them after being processed at an immigration detention center. “Pretty often the court will require the government to make sure that someone gets their wallet back, and how much more significant is a person’s child or family member,” Ormsby said last Thursday during a hearing related to the detention of a Honduran woman, who had been separated from her 16-year-old daughter after being sent to federal court and given a time-served sentence. That woman, who was detained May 21 and sentenced two days later before Ormsby, was returned to the processing center only to find that her daughter had been removed by ICE, sent to HHS and then placed in the custody of ORR at a local detention facility in the Valley. Ormsby said an order could come down as early as Thursday, when he set a hearing with representatives of the government and the Office of the Federal Public Defender. Characterizing Ormsby’s potential order as a “challenge,” Padilla’s tone was non-committal when asked if his agency would adhere to it. Protesters gathered outside the immigration processing center on Sunday to voice their concerns. They were awaiting the visit of several lawmakers from around the country, specifically U.S. Sen. Jeff Merkley of Oregon, who was back in the Valley two weeks after being denied access to a detention facility in Brownsville. Members of local, state and national immigration advocacy groups convened just across the street as immigrants continued to be processed inside the facility. Ai-Jen Poo, director of the National Domestic Workers Alliance and part of the “Families Belong Together” national campaign, was at the protest to join in a “Father’s Day Vigil,” which her organization planned as part of Sunday’s gathering. Poo said the detention of parents and guardians from their children is an inhumane practice. Protesters, enduring the nearly triple-degree weather Sunday afternoon, held signs, sang songs and chanted slogans of solidarity — “no están solos,” or “you are not alone” in Spanish. Merkley was accompanied by U.S. Reps. Vicente Gonzalez, D-McAllen, Peter Welch, D-VT, David Cicilline, D-RI, Mark Pocan, D-WI, Sheila Jackson, D-TX, and Sen. Chris Van Holland, D-MD. Calling for the administration to immediately “cease and desist” the policy, the lawmakers said they will continue to push for a legislative fix to this issue. The group, which made its first stop at the processing center, was also going to tour the Hidalgo Port of Entry and the Brownsville detention center, among other stops scheduled Sunday. U.S. Rep. Filemon Vela, D-Brownsville, who was at the protest and is scheduled to meet with religious leaders and lawmakers Monday afternoon in Brownsville for a roundtable discussion on zero tolerance, said the policy is putting additional pressure on several entities, including federal court systems. “As a result of the policy, every part of the system is under stress, from the federal courts themselves to the U.S. magistrates, to the U.S. Attorney’s Office, to the public defender’s office, to Border Patrol itself, and to the HHS side,” Vela said outside the processing center.